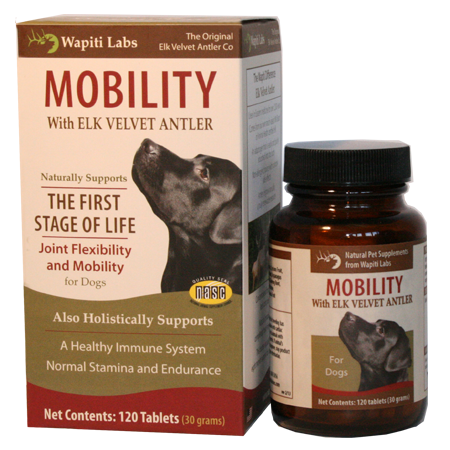 Mobility Supplement for Dogs | Elk Antler Supplement | Wapiti Labs, Inc.
Wapiti Labs natural blend of Elk Velvet Antler (EVA) and traditional herbs is formulated to support positive joint function as well as help maintain joint mobility for dogs. Available as a concentrated formula available in powder or tablets. Uses no synthetic ingredients and a proprietary processing method. Trial Packs are great ways to try our products. We have specially sized them for small/medium dogs (7 tablets) and large dogs (12 tablets). We can offer trial packs when many others cannot because the components in EVA work synergistically, absorbing quickly into a dog’s body. Our products also require only once-a-day dosing and no long load times! My 1 year old Bernese Mountain Dog was very ill in January and had to have a pine cone removed from his intestines. He was not bouncing back although his digestive system seemed to be normal. In addition, he developed serious hip problems. We did not know if he had injured himself or what caused the sudden weakness. I decided to try the Mobility formula for his hips. I reviewed the other ingredients and discovered the benefits they offered as well for the “whole” of my dog. I had forgotten that Chinese Medicine treats the Whole Being not just a specific symptom. Within 24 hours, my dog was showing signs of healing not only in his hips but also in his overall wellness. It has been 3 weeks and he now has his strength back in his hips and he plays like my puppy again. Thank you so much for providing this product for our pets. This has helped my 12-year-old Beagle so much. She was having trouble getting around and would cry out. Her holistic vet recommended this product and she has been taking it for at least a year now and has shown marked improvement. So, I would say that the Mobility is the most effective thing I’m giving her. Huge difference in our mix breed 50 lb dog. He struggled with his back legs and it was getting worse every year. We started him on Mobility and noticed a difference within a couple of weeks. We just had him at the vet for a checkup and the vet said he couldn’t believe it was the same dog! He also gained his muscle strength back in his whole hind end. Awesome Product. My 83 lb, 12 year old, wise and beautiful golden retriever was really getting weak & stiff his back legs. After less then a week of including Mobility 2x a day in each meal, he was walking with ease, getting up and down steps with no effort and generally relieved from his stiffness. We all thank you! I recommend Mobility highly. My 12 year old corgi/beagle mix has had knee problems for several years. He injured his back right knee about 4 years ago and then injured his left back knee this past March and he could barely walk. He was doing more of walk, hop and couldn’t go too far. I came across the Mobility supplement and he is now walking on all four legs. I can take him on short walks once again which he enjoys. This is the most amazing supplement I have come across and I tell everyone about it. After years of expensive medicines, this is the first product that I have seen results from. I can’t speak highly enough about it. Both Milo and I are grateful for it. My three year old Siberian Husky, Ilsa, was recently experiencing a lot of joint stiffness. I had taken her to the vet with the goal of gaining more information regarding her general lethargy, lack of interest in playing, and lengthy sleep schedule. After researching alternative options, I decided to give Wapiti Labs Mobility a try. It only took a few days to see results. It started with her sleep schedule cutting back to a normal amount, followed by increased activity. Now–two weeks later–she’s like a different dog. She plays and runs with ease, has a monumental amount of more energy, and moves without stiffness. I am forever indebted to Wapiti Labs for creating a product that has allowed my little Husky Ilsa to move and play like the pup she is. We love the Mobility tablets for our Dog Buddy. He has lots of energy but needed support for his joints. He loves to play fetch everyday and once we started giving him the Mobility Supplements we noticed how much easier it was for him to get up after playing and to be able to chase the wiffleball around the field! He is like one of the kids, busy playing! Thank you Wapiti for your great products! My 100 lb, 13 year old 4 legged family member has been having mobility problems. In the last few months, his back legs will give out and he will trip or even splat fall. The owner at my local pet food store suggested that I investigate Mobility because he’s had some good luck with it. I started my guy on 2 pills with his dinner every night and there has been about an 80% improvement. I don’t know how it works or why it works, but I do know that it worked on him. At one point I ran out and had to wait several days for the next shipment to come in and his back legs worsened and he was falling again. It worked within a week and it worked well. My vet hadn’t heard of Wapiti Labs Mobility, but she saw the difference in my guy and was impressed. I’m a skeptic, and I did my research. I’m not so much into holistic or natural remedies, but I’m a believer in this one. At 6 months old my Tibetan Terrier was having elbow problems. I was devastated and he was so uncomfortable. I love my dog and wanted to help him. I was talking with a woman at the dog park who had used this product with her dog who had some of the same issues. She said that with in a few weeks she had noticed a difference. I thought I would give it a try and contacted the manufacturer. After 2 weeks of being on Mobility my puppy was back to acting like a puppy and running laps around the dog park. I now tell anyone I know who has a dog with joint problems to try this product. I gave this to my 12 year old collie and it was the perfect supplement for her ailing hips and back. she lived to be 14 plus and kept moving until her last day. I am now giving it to my rescued 3 year old border collie with hip issues. she runs and jumps all the time and you would not know there was anything wrong with her. I bought this product because of the of this story. One of the ladies at my favorite pet food store has a mastiff that is 7 years old & in pretty rough shape. She wasn’t sure about surgery & somehow she ended up talking to someone at Wapiti. She was told that if she gave her dog the Senior Mobility she may not need to do anything harsh. This lady knows enough about the dog product industry & believed her enough to try it. The result was …. Amazing! Her dog recovered and is doing fine! Tux is 2 years old and a very active dog! I started him on Wapiti supplements to help recover from an injury. I’m pleased to have found this. We are at the park everyday with a couple of balls & a Frisbee…sun, snow, downpour and mud, it doesn’t matter.He needs exercise & to get tired out in the mornings so he won’t drive my wife crazy! He plays hard running at up to 35 miles per hour (he wears a GPS for mileage & max speed), lots of jumping and lots of sliding. His joints were really taking a beating. I’m glad I have him on this natural supplement not only to keep him in top form, but also to help prevent joint problems in the future. It is one of the only supplements he is willing to take. When it comes to food and care we try to provide him with only the best. That is what I believe this product to be. I liked it for him so much, I now take the human line, too! I was amazed…skeptical that it could make a difference in one week, but seriously after two days he was back to greeting me at the door in the evenings!! He seems to be less stiff and moving better! I recommended to my sister who recommended to her boss!